Nine years have passed since the events in the final season of the show. Veronica (Bell) Mars has said goodbye to her life as a private investigator. She has lost too many friends along the way. She has left her hometown of Neptune, California and has moved to New York City to start her life over as a successful lawyer. She has received news that her old classmate Carrie, who is now pop star “Bonnie DeVille”, has been found dead in her bathroom. Veronica’s ex-flame Logan Echolls (Dohring) has been accused of her murder and calls Veronica for some legal aid. Veronica feels the need to go back to Neptune to help him out but only plans on staying a couple of days. Her dad Keith Mars (Colantoni) is beyond thrilled when she shows up at his office at Mars Investigations. Old habits are hard to break as Veronica cannot seem to shake the feeling that something doesn’t add up. She firmly believes that Logan is innocent and feels compelled to stay in Neptune a bit longer. It doesn’t help that she feels some of her old classmates probably know more than they are leading. Let’s forget that Bonnie had an obsessive fan (Hoffman) that is equally a bit nutty herself. 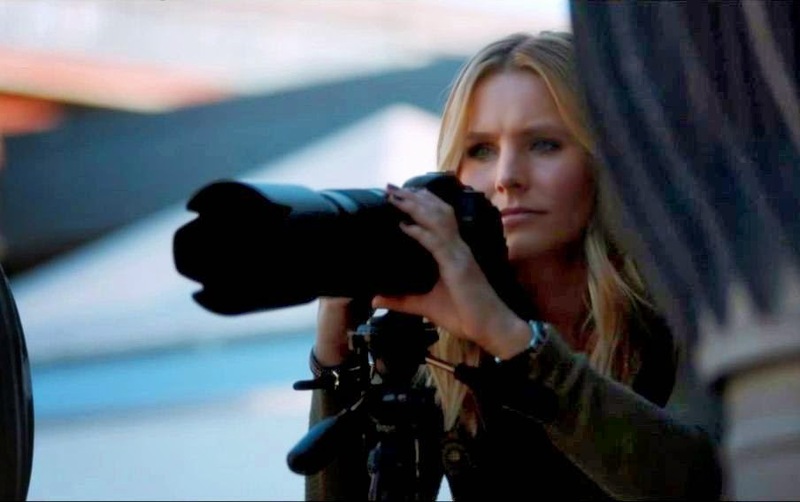 It’s refreshing for fans to see a majority of the old cast come together again for this new Veronica Mars case. Percy Daggs III, Francis Capra, Ryan Hansen, Tina Majorino, Krysten Ritter and a slew of other cameo appearances get audiences of new and old back into the spirit of the show. There were plenty of fans of the show in the audience and you could tell where there would be a little nod or reference as little giggles happened with excitement. It should also be known that series creator Rob Thomas (not the singer) wrote and directed the film, and Kristen Bell is one of the executive producers. You may be asking yourself how and why they are still in Neptune. Are we to believe that Veronica was the only one that moved away? Their high school reunion just happens to be the same weekend that the murder of Bonnie DeVille happens which coincidentally helps with the idea that all of the old faces are back together. I am getting a bit sick of using a high school reunion as the catalyst to bring people back together. Luckily, it is not the sole focus of the movie like it was for American Reunion. For someone who has never watched the show, the film is fairly entertaining. There is a quick montage at the beginning to set up the character relations and give a brief recap of what happened during the show’s run. As for the rest of the story, I never once felt like I didn’t know what was going on. Yes, obviously having a background with the show would help deepen your knowledge of the characters but you quickly realize who Veronica’s friends are as opposed to her enemies and whatnot. I must say there were some shocking moments along the way that I audibly gasped at that took me by surprise. Maybe the show was like that and I’m not giving it enough credit. It’s easy to see why the show has appeal as it plays smarter than your average teen soap typically found on the WB or UPN at the time. Kristen Bell and Enrico Colantoni have an infectious father daughter relationship full of fun banter and witty rapport. It’s due to the fans that this movie even came together. Thomas and Bell created a Kickstarter campaign to raise the funds needed to make the movie happen. I applaud their effort as it pays off for the die-hard Marshmallows as well as those like myself that are new to this universe. Anyone that watched the show will no doubt get a big kick out of the film. If you have never seen the show, the film may feel like going to your spouse’s high school reunion. You will most likely go, have a great time, enjoy the people that you meet, but you don’t have the history or connections that everyone else has. I am now even inspired to go back and watch episodes of the show. Is it worth your trip to the movies? Yes. The film works well as it’s own story without making the newbies feel too left out.